Arthritis is common condition that affects a large portion of the population. While many people consider arthritis as a condition that can affect your back, hands, knees and hips, arthritis of the foot and ankle can also occur. This can cause both pain and disability to the sufferer as well as altered walking mechanics. 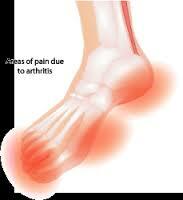 At Podiatry HQ we offer a thorough assessment of your arthritic foot condition. An assessment of the length, severity and type of symptoms will be conducted to shortlist the type of arthritis that is presenting. X-ray, MRI, and Ultrasound imaging can be organized to determine the extent that the arthritis is affecting your foot. Consultation with your GP may be conducted if systemic conditions such as gout, or rheumatoid arthritis are clinically suspected. For osteoarthritis symptoms, biomechanical and musculoskeletal tests will be conducted to determine the impact that the arthritic joint is having on surrounding structures. In addition, comprehensive footwear and orthotics advice is given to patients to help minimize painful symptoms, as well as appropriate short term pain relieving options such as anti-inflammatory or arthritis creams, icing or heating and strapping or bracing of the affected joint.